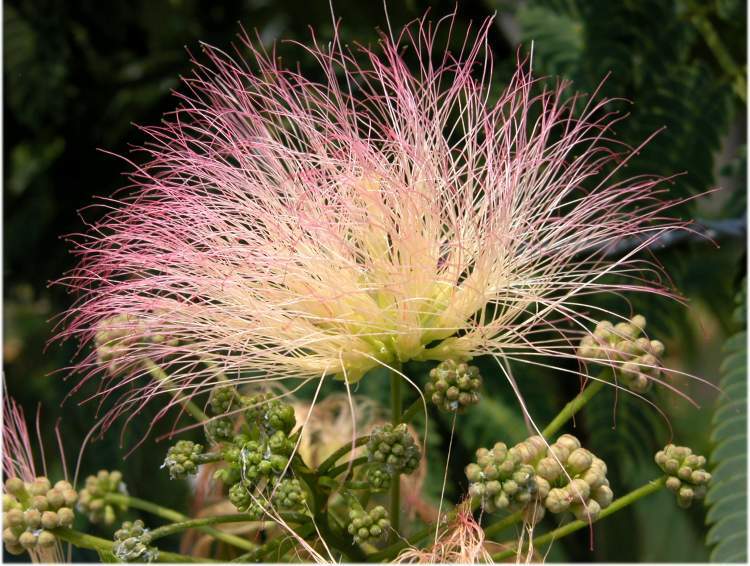 Albizia julibrissin. 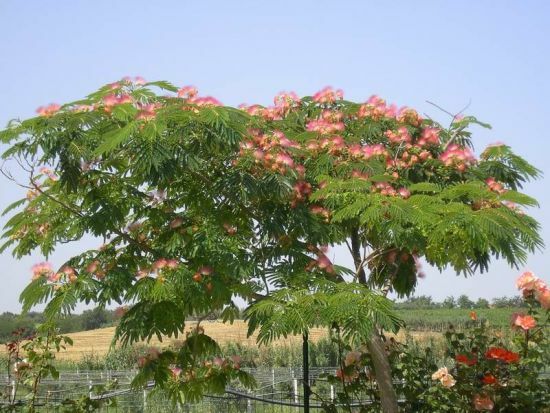 Albizia julibrissin. tree. Photo by Franco Rossi. luirig.altervista.org (Accessed 7/2017). Albizia julibrissin tree to 10 m tall, about as broad as tall, often multi-stemmed, bark smooth, gray-brown. 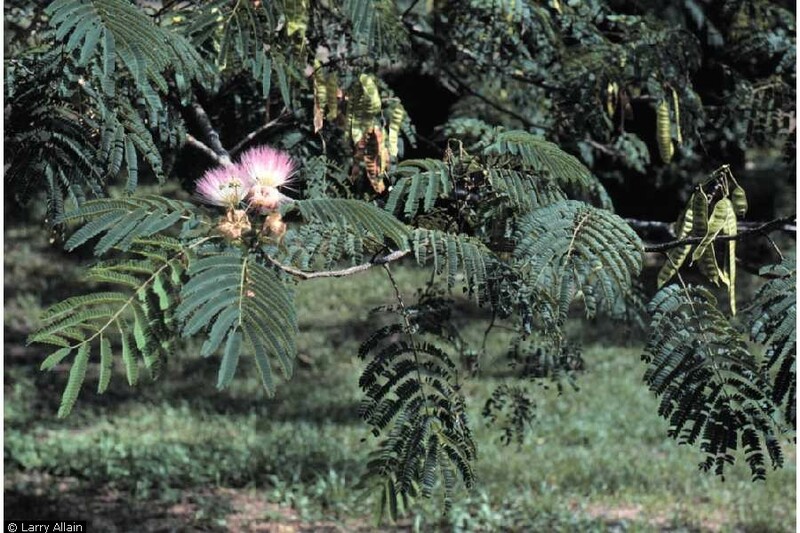 Albizia julibrisson.Larry Allain @ USDA-NRCS PLANTS Database (Accessed 12/2014). Leaves alternate, twice pinnate, finely divided, pinnae 4-12 pairs, opposite, to 20 cm long, leaflets opposite, 20-30 pairs, to 1.5 cm long, oblong, tip blunt, base very unequal, leafs out very late, late May to early June, killed by first frost. Dipartimento di Biologia, Università di Trieste – Picture by Andrea Moro – Comune di Monfalcone, centro abitato., GO, FVG, Italia, – Image licensed under a Creative Commons Attribution Non Commercial Share-Alike 3.0 License (Accessed 7/2017). Flowers pink, small, in powder-puff-like heads along ends of twigs, petals 0.8 cm, stamens 1.5 cm, numerous, more conspicuous than petals; blooms June-Aug.
Fruit pods flat, grayish-brown, to 15 cm long, 2 cm wide, with several seeds, Sept.-Oct., persistent through winter. Habitat: May sometimes escape from cultivation in NYC. 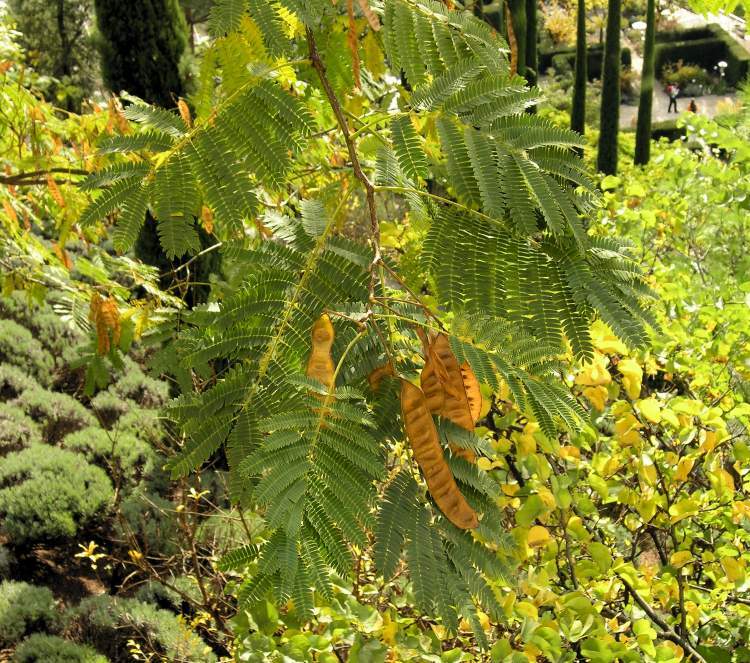 Notes: Mimosa wilt is the most destructive disease affecting A. julibrissin. It is caused by Fusarium oxysporum f. sp. pernicosum (Deuteromycotina, Hyphomycetes). The first external symptom is yellowing, drooping leaves, but brown streaks in the sapwood appear before leaves wilt. This disease can kill a tree within weeks or months. The pathogen is present in the soil as spores, which germinate in contact with small roots. Mimosa is also attacked by Ganoderma lucidum, another root fungus (see Sassafras). Wounded trees may be infected by Oxyporus latimarginatus (see Hackberry) and Nectria cinnabarina, Coral spot canker (Sinclair et al. 1987). Leaves eaten by twobanded Japanese weevil, Callirhopalus bifasciatus (Johnson and Lyon 1991).